Predestination is an anomaly from any genre that you may try to place it in. Sci-Fi? Sure. It’s about time-travel, but it’s just as much about law enforcement. Cop drama? Yes, but it’s also about the life of a hermaphrodite. Alternative Lifestyles? A little, but it’s also about social and personal ethics. Are our lives predestined or created by free will? 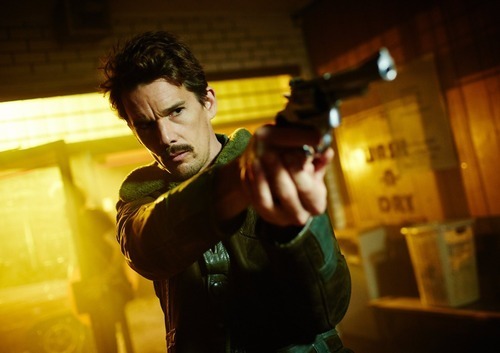 Predestination is a genre busting, artistic film with grit, brains, a bit of gristle and a whole lot of style. Made by the Australian twin brother film duo, the Spierig brothers, the film is based on the short story “All You Zombies,” by Robert A. Heinlein. The title comes from one of many poignant lines in the film which is written with swift precision and craft. The strong story is accented by powerhouse performances. Ethan Hawke embodies his role with smooth comfort, strength and grace. Sarah Snook wrestles with the nuances of her role with a ferocity that is a wonder to watch and Noah Taylor adds a level of authoritative calm to the cast as Mr. Robertson, the overseer of the Temporal Agents. The ratings and reviews for Predestination are overwhelmingly positive. It is set to be an underground classic in the vein of The Machinist or Children of Men. It’s bouncing into theaters, mostly for short runs, so try to catch it if it comes your way.